Feline Santa...ready to get a felt backing. I started two new Bucilla Santa ornaments. Sixteen tiny dots appliqued in place. I actually turned on my midarm...first time in eight months. Worked like a charm...except my hopping foot isn't centered...I've tried to fix this problem before and am trying again. I got a new set of templates and the 1/4" markings won't match up perfectly if the needle isn't centered in the hopping foot. I'm very good at muscling around the problem but it sure would be nice to not do that. All of the sudden I am having a crush of quilt design ideas. I have actually bought some fabric for a fireworks-inspired quilt. I suppose I will just have to try and be ready with it for next July 4th...not going to make it this year! And years ago I did a 12-day rafting trip on the Colorado River through the Grand Canyon...a quilt design idea popped into my head spontaneously two weeks ago that I feel captures my adventure. The name was very easy to come up with, "Into the Raging Water." It is going to be a sampler with blocks named after the major rapids and other sites along the route. I would like to just drop everything else and work on these two quilt ideas...but I still haven't finished quilts I designed seven years ago...like this one!!! I wish I could buy more hours in a day. Yesterday was the third Thursday of the month and I completely forgot about the "Breakfast Club" gathering. ARGH!!! My favorite day of the month...gone. I certainly wasn't sitting around eating chocolate all day. It was a very productive day so at least I feel good about that aspect. The number one project right now is to finish up my furniture refinishing projects. My husband gets home on Tuesday and he might want to drive his vehicle...that big red truck that is really cramping my work space. This isn't our first rodeo...you can never have a big enough garage. We built a four-car garage in our new home for just two vehicles...well there are a few other "vehicles"...four-wheeler, motorcycle and an assortment of airplane parts. Like I said...even the four-car garage isn't big enough sometimes. Back to the positive news...the first coat of varnish is on all the pieces. I just plan on two coats so tomorrow I hope to sand everything and add the final coat of varnish. A few days to "set" before moving would be very nice to have. I have also been spending lots of time shopping on the internet. My most recent home purchase came amazingly quick. A floor lamp with three arms. It required some assembly but all those years spent playing with Legos has paid off! I ordered this light from Overstock.com. This is my second purchase from them. The first is the round black table in the photo above. I love that table and I cannot believe how perfect this light is!!! Each socket will house a 100 watt light bulb...300 watts of illumination....perfect for my hand-sewing projects this winter. Each arm and light is wonderfully adaptive to repositioning to include the angle of the shades. It is always a huge relieve when something you have ordered over the internet is just what you want and a great bonus when it is even better than you expected! One more recent addition to the house...a narrow table for my narrow entryway. I had this made by my handyman. (No...not talking about my husband!) I discovered a wonderful handyman right after moving into our unfinished house that I had to finish while my husband was in Paris. He is almost part of the family! Did you ever watch the sitcom "Murphy Brown?" Remember the house painter character Eldin? It's kind of like that...our list of projects seems to be never-ending. I am determined to actually get a quilt started on my midarm. I had hoped to finish quilting this before attending June's Breakfast Club....I think my forgetfulness about the sewing gathering was subconsciously connected to my failure to meet my self-imposed deadline. The hardest part of quilting on my midarm is coming up with a plan. Winging it doesn't work when ripping out is beyond torture. My best tools...plexiglass and a dry erase marker. I like to draw the whole design out with a tissue paper layover on a photo or drawing of the quilt. I don't want any surprises about secondary designs that could develop. Only one casualty from the 5.8 earthquake...a row fell off my design wall. And finally...another project I am working on...getting a puppy. I have a Gordon Setter on reserve in Wisconsin. 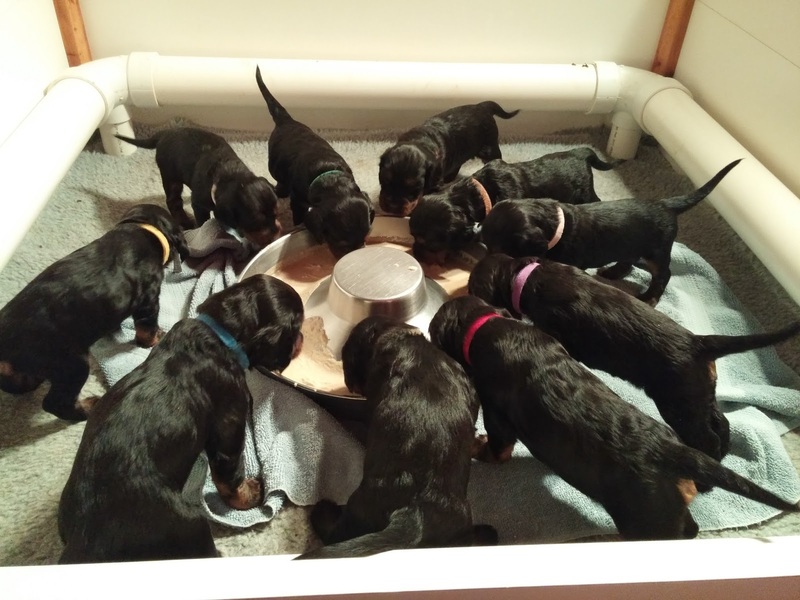 She is one of 10 puppies born on May 24th. Always good to end on a very happy note. Not much to report on the quilting or needlework front...house projects are dominating my schedule. My husband will be home for the month of July so I'm on a big push to get some furniture refinishing done. My work area is our garage...right next to my husband's truck. I can't have him driving in and our while tackling staining and painting on the polyurethane layers. Drawers for two night stands. They were in great shape but I had to strip them to stain to a darker color. They are finally stripped to the bare wood in this photo. I had new night stand bases made for the drawers. Sanded...ready for staining. The original pieces were made from laminate and were sagging. The new night stands have a four-inch base added to accommodate the higher profile beds currently in fashion. There is also a dresser...the drawers were stripped and the first coat of stain has been applied. I hope I have some great "after" pictures soon. A very tedious project. I'd rather be quilting. The weather continues to be amazing. My flowers are bursting forth. A Lobelia basket with Nemesia I added. One of three biggie-sized planters on the front side of our house. I was hoping to successfully winter over some perennials in these planters and add annuals for color. The Bleeding Hearts survived last winter. I'm trying some Day Lilies this year. One of nine planters on my deck. I love them! They will be taking over the deck by September at the rate they are growing. I think we are at 21 hours of sunlight right now. Extreme sunlight does amazing things!!! No major critter sightings lately though I did heard bit of gun fire two nights ago...I'm sure it was bear related. Hopefully just trying to scare one away. There was one big shake up today... an earthquake that was 5.8. This one lasted several seconds...many of us thought it might develop into the "big one." There was such a rumble leading into it, I thought perhaps a large jetliner was about to crash into the mountain side. We are too far away from railroad tracks or a street with semi trucks...the accompanying noise was quite impressive. But when you think about the granite mountains that surround me that were shaking...that would have to make some amazing noise! Love how this kit is coming together. Time to sew the blocks into rows. The border is so cute...trees...can't wait to start putting it together too. Two ornaments finished. These were very labor-intensive. I must have spent at least 20 hours sewing these little Santa's. There are two more Santa designs in the kit...so four more ornaments to make. I am hoping I actually get a quilt loaded on my midarm. I need to get in the machine quilting groove. The weather is cloudy so no sun to distract me. We got home from our trip to Houston, Texas for a family reunion. I think we got out of there just in time as rain has returned to the region. Alaska is experiencing extremely high temperatures which doesn't happen every summer. It was 86 degrees in our town yesterday...we normally feel very lucky to hit temperatures in the 70s. Air conditioning in homes is rare so we are all not used to heat like this. The threat of fire is very scary. None of the current fires blazing in Alaska are near my home but it is the one thing that frightens me the most since we moved to such a rural location. Air travel means time to work on cross stitch projects. I started a new one for the trip. Right before I left, I got a start on sewing the front and back sides of this Santa ornament together. Lots of thread color changes so haven't finished this yet. And since it has been soooo hot...I have spent a little time in my studio since it is in the very cool basement. I love the colors in this kit! I am very behind in the computer world...having too much fun with everything else! Meet one of my neighbors on our back property line...this is Stormy. He's a yak. 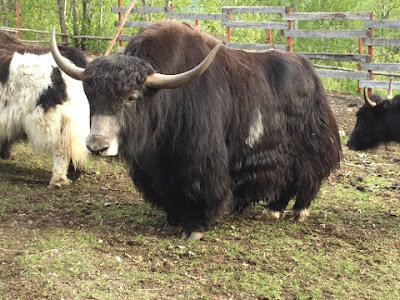 I don't know much about yaks except they look like something cavemen drew on the walls of their homes. 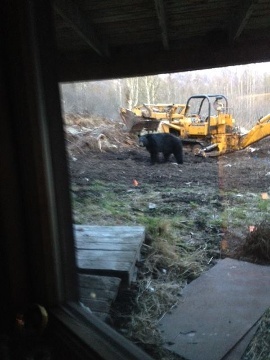 Thankfully, I never saw the bear...though I heard something big moving through the woods. 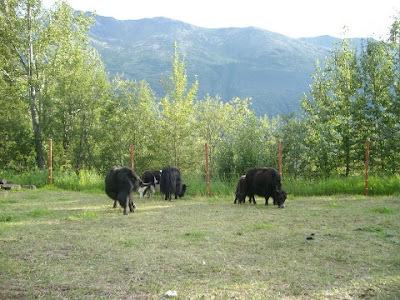 Stormy was very upset by the bear's visit and while the mother yaks surrounded the babies to the protect them, Stormy broke through the corral and was running along Eagle River Road where a driver stopped and got video of Stormy running. It made the local evening news! It is also posted on YouTube...check it out...it is only about 10 secs...you might not get another chance to see a yak running! Life is normally very serene for these yaks. What a luxury to have my portable design wall so big and so close to my sewing machine! All of the light blue bear paw blocks are constructed...time to make the dark blue blocks. The backsides have been put together for the Santa ornaments. I am hoping to finish these tonight while I am watching the latest episode of, "Game of Thrones." I think there are only two episodes left. When is the next book going to ever come out? I think the HBO series has caught up with the five books. A bit more work on the French Santa as well. It is time for another travel adventure. Family reunion in Texas this coming week. A few of you might have expected to see "real" bear paws given some on the critters I see around my Alaska home but today it is just these really cute quilt blocks under construction. I'm tackling my kit from Hancocks of Paducah. New to me in this kit's instructions is using the Easy Angle and Companion Angel. More tedious cutting up front but the Half Square Triangles are the perfect size and the blocks are coming together quickly with nice, sharps points. Love that! I have had this set of rulers sitting in a drawer for many....many years...at least 5 years and possibly as many as 10. It does make me wonder what other gems I am missing out on in that drawer of rulers! My evening work has been going slow. I actually have a social life now that I am back home in Alaska...which is wonderful...but that means I am not spending much time on these guys...still...a little time here and there does add up to a completion someday.